The apartment was very neat, tidy & had everything I needed. The bed was extremely comfortable & slept very well. Staff were friendly and welcoming upon arrival and departure, and the bed was comfortable. The super comfortable bed and amazing views The amazing and very lovely staff! Good location and nice staff. Price is reasonable. Spacious room. The customer service was excellent, the room quality, cleanliness, facilities and of course the bedroom itself. Nice big comfy apartment, great for family. Nice view too. Easy check in and check out, the room size was awesome. I always love the beds at these properties, they are so comfortable! It is also convenient location and easy parking found a couple of streets away. 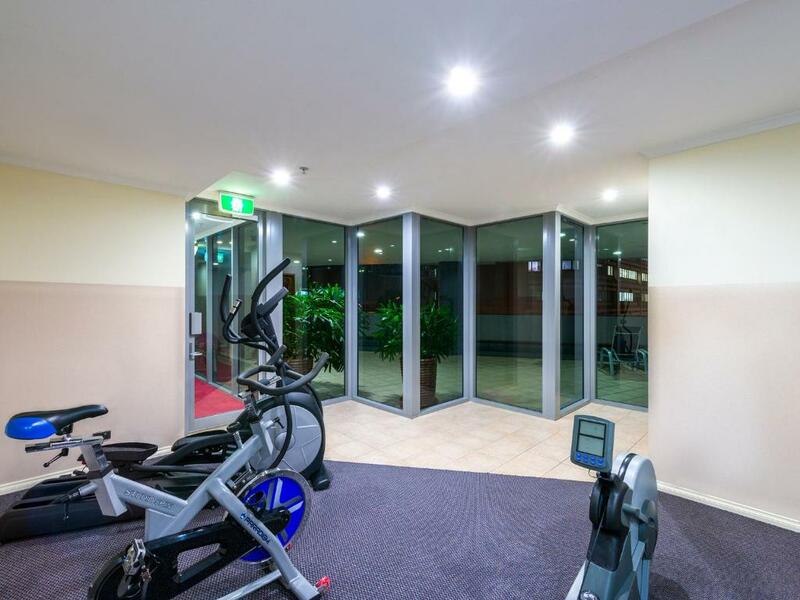 Location was handy to the city mall, the parking was reasonable compared to other Brisbane properties, but still expensive. Nice size balcony, however the furniture was sparse. Lock in a great price for Mantra on Edward – rated 8.5 by recent guests! 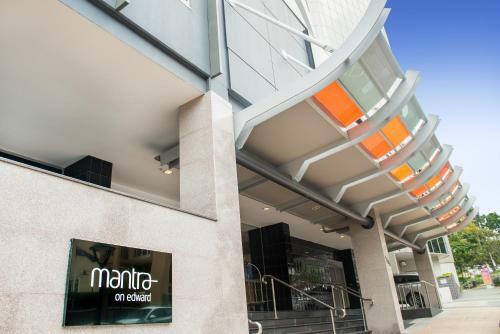 Mantra on Edward This rating is a reflection of how the property compares to the industry standard when it comes to price, facilities and services available. It's based on a self-evaluation by the property. Use this rating to help choose your stay! 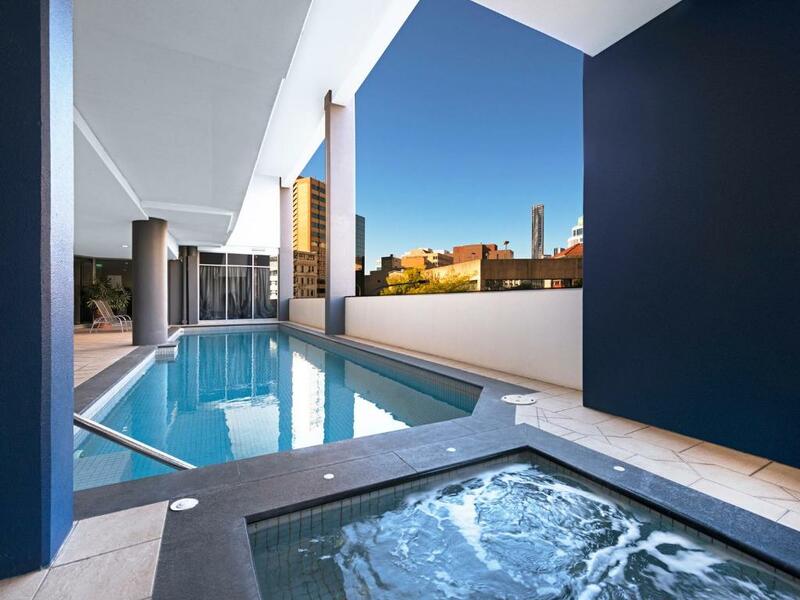 One of our top picks in Brisbane.Boasting a heated swimming pool, a fitness center and a 24/7 front desk, Mantra on Edward is located in central Brisbane. The modern apartments offer a fully equipped kitchen and large flat-screen TVs. Guests also enjoy a sauna and hot tub. Brisbane Mantra on Edward is 1,500 feet from Queen Street Mall. It is 15 minutes' walk from Eagle Street Pier, which offers views across Brisbane River. Queensland Performing Arts Center is 20 minutes' walk away. Central Station is conveniently a 5-minute walk from the property, while Roma Street Station is an 11-minute walk from Mantra on Edward. Each air-conditioned apartment offers a dining setting and a lounge area with a sofa suite and coffee table. All apartments include a bathroom with a shower, hairdryer and guest toiletries. 뀐 Located in the top-rated area in Brisbane, this property has an excellent location score of 8.8! When would you like to stay at Mantra on Edward? This air-conditioned 1-bedroom apartment offers a fully equipped kitchen and laundry and a dining and lounge area with a sofa and a 40-inch flat-screen TV. The bedroom offers 1 queen bed and a separate bathroom. All rooms have balconies. This air-conditioned apartment offers a fully equipped kitchen, a dining setting and a lounge area with a sofa and a 40-inch flat-screen TV. We are 5 minutes walk from the Queen street mall where the Myer Centre and David Jones Centre are both located. There is also a Woolworths and Coles Centre in the same vicinity as these. We are also 10-15 minutes walk to the Eagle St Pier, where there are a number of restaurants and cafes. The Roma Street parklands are 5 minutes walk and South Bank Parklands are a 20 minute walk from us, both these parklands having children play areas. South Bank also has a number of restaurants and museums. House Rules Mantra on Edward takes special requests – add in the next step! A AUD400 damage deposit is required on arrival (around USD286.06). This deposit will be fully refunded 14 days after check-out, as long as there isn't any damage to the property. Mantra on Edward accepts these cards and reserves the right to temporarily hold an amount prior to arrival. Please note that a housekeeping service is provided on a weekly basis. For stays less than 7 nights or if more frequent housekeeping is required, you can request additional housekeeping at an extra charge. Please note for bookings of 5 or more rooms, guests must sign the property's Terms of Stay. For further information please contact the property in advance using the details found on the booking confirmation. A damage deposit of AUD 400 is required on arrival. That's about 286.06USD. This will be collected by credit card. You should be reimbursed within 14 days of check-out. Your deposit will be refunded in full by credit card, subject to an inspection of the property. It was close to public transport and the mall. Price of parking is a bit exorbitant for such a small car park. We asked for a late checkout so the children could have a swim without the rush of checking out and the pool was closed the next morning with no explanation. The biggest tick for me was the staff member that checked us in and continued to assist with any extra questions with huge smile on her face and extremely friendly attitude. Reception took a security swipe of our credit card upon check in and charged us for the stay as well without our knowledge. We were then charged again for the stay upon check out. Luckily we checked our statement within a day of leaving and discovered the double charge. Frustrating. Exhaust vents in bathrooms were filthy but were not working. Traffic noise was the main downside. Bed was comfy and very big! Kitchen had everything I needed. Staff were helpful and accommodating with parking requirements. It is in a great location.